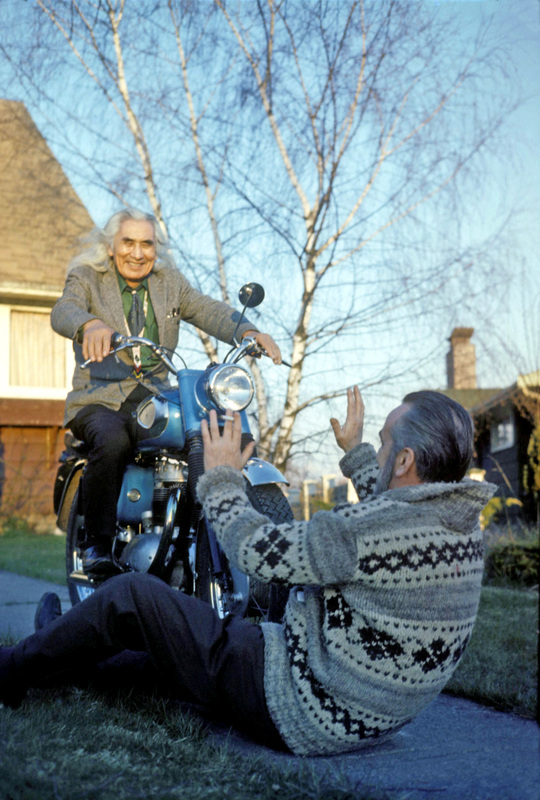 Chief Dan George was a friend of ours before he became famous as a movie actor. He was from the Burrard Reserve, but was an honourary Chief of the Squamish, just as my huband was. He seemed to be related to everyone on the Burrard reserve! When his wife, Amy, died he needed to get away so he could let his emotions have free rein. Percy Paull phoned to see if it would be alright to bring him over to our place, and he stayed over night with us. Ra’s band and some of our boys’ friends were there and they got Dan singing and enjoying being there. He pretended to run over Mickey with the motorcycle! This photo shows the Cowichan sweater that was presented to Mickey by the Paull family. Amy’s funereal was from St. Paul’s Cathedral in downtown Vancouver, and the place was packed. Chief Dan was very sad, missing Amy. When Easter came he wouldn’t get out of bed. His Daughter, Marie, phoned and asked us to come over and see what we could do for him. We were able to talk him into getting up, and going with us to our place for Easter Dinner. I remember driving over the Lions Gate Bridge at a very slow pace because of the jam up of traffic. People that were walking recognized him, and were waving and calling to him. It did help in bringing him “out of it”, at least for that day. Love that photo and the smile on Chief Dan George and that was a great looking sweater that Harry received from the Paull family.A wonderful story Norma of how people of all races can be friends with each other and be there for each other in times of need just like you were there for Chief George after his wife died! Have a wonderful day Norma! Keep shining my friend! A beautiful story of kindness and support – and the extent to which your friends believed in you and Mickey. Just so wonderful, Norma. Hi Dianne. Thanks for your wonderful comment. I do appreciate it. Shall we have tea? Good morning, Heather. the teas ready. Dianne is over there with hers , so we can join her. I do so much appreciate your kind comment. They were very dear friends, and we were so blessed by having some time together. We learned so much from them, and I will never forget all their kindnesses to me. Not just the gifts, but there accepting me as a friend. what a fun photo, and so interesting to hear the story behind it. True friends always brighten difficult times. Hi Harold! Nice to have talked to you in person. Sorry I can’t find the photo I was looking for. I hope you come back and visit again.